Gov. Phil Murphy today proposed a $38.6 billion budget that again raises spending and increases taxes even as it boasts more than a $1 billion in savings. The plan, outlined in the Governor’s annual budget address, would cut $1.1 billion in costs, including nearly $800 million in public employee health benefit cost savings and another $200 million-plus in departmental savings. It would also end with a surplus of more than $1 billion. Nevertheless, spending would increase by 3.2 percent over the current budget and 11.2 percent over the FY 2018 plan, the last one under Gov. Chris Christie. Murphy talked at length about investments in NJ TRANSIT and education, and talked extensively about protecting the middle class. He did not mention tax increases directly in his remarks, referencing only applying the “millionaires tax to all millionaires.” His proposed budget would lower the threshold on the top income tax rate from $5 million to $1 million, effectively increasing taxes from 8.97 percent to 10.75 percent for people making between $1 million and $5 million. He is also counting on revenue from the legalization of marijuana as well. A new revenue raiser is what the administration is calling a Corporate Responsibility Fee. It would charge businesses $150 per employee for large employers with more than 50 employees relying on Medicaid for healthcare. “This fee will incentivize employers to provide benefits, and ensure that everyone pays their fair share for the Medicaid coverage that taxpayers support,” according to the administration’s description. For business, the budget is more of the same: higher taxes and more government spending. NJBIA is especially concerned about the long-term effects of increased spending. As it is, New Jersey revenues are not covering what the state spends now. As NJBIA’s analysis, “New Jersey’s Financial Cliff,” showed, New Jersey’s debt obligation has grown 382 percent over the past 10 years while revenues have only grown 23 percent. “We can no longer wait to take a broader view at top-line reforms, as articulated in the New Jersey Economic & Fiscal Policy Workgroup’s Path to Progress report,” NJBIA President and CEO Michele Siekerka said in a statement following the address. She also criticized the plan for its impact on the business community. “Today’s proposal will not improve the outlook for New Jersey businesses, which saw tax increases and a wave of costly mandates over the past year that collectively strike hard at profit margins and overall competitiveness,” she said. The situation is bleak because people and businesses are backed into a corner and Murphy’s position is either take it or leave it. It’s so sad what is happening to our home especially since it’s completely avoidable with the right leadership and solutions. The healthcare access in NJ is so antiquated and out of date that it’s bankrupting the State and unfairly punishing income and property taxpayers. 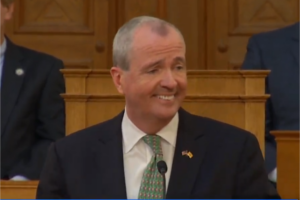 Murphy is an outsider and I don’t think he really understands just how powerful NJ used to be economically or just how much was invented and manufactured here. His myopic government run all, top down authoritarian my way or the highway vision for NJ is devastating to businesses, families and quality of life here. Sadly businesses and people born here with family roots going back generations have no choice but to leave. As a small business owner that has location flexibility, this Wall Street con man has completed the troika of Progressive charlatans ( Murphy, DeBlasio and Cuomo ) that seem hell bent in making the NY/NJ area liveable only for the rich and those dependent on the States / City for their livelihood. People like me feel we have a target on our backs to provide the funding they depend on to continue the tax and spend policies that will only end when we “targets” move our job creating capabilities to States where we are appreciated and not used as a piggy bank for corrupt politicians that are drunk on their own power.